Some of the best actors, filmmakers and writers of the century assemble in William S. Burroughs: A Man Within, the first (and only) posthumous documentary about this legendary figure. an upcoming feature-length independent documentary on the writer directed by Chicago Director Yony Leyser. To saw we're excited about this one is truly an understatement. Besides being a fan of his writing, Cronenberg's Naked Lunch is one of our go-to films, if not one of the most adventurous and provocative flims ever made. 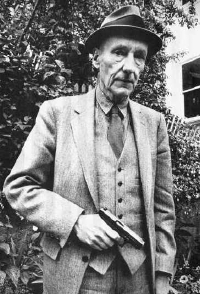 The film investigates the life of legendary beat author and American icon, William S. Burroughs. Born the heir of the Burroughs adding machine estate, he struggled throughout his life with addiction, control systems and self. He was forced to deal with the tragedy of killing his wife and the repercussions of neglecting his son. His novel, Naked Lunch, was one of the last books to be banned by the U.S. government. Allen Ginsberg and Norman Mailer testified on behalf of the book. The courts eventually overturned their decision in 1966, ruling that the book had important social value. It remains one of the most recognized literary works of the 20th century. The film features never before seen footage of William S. Burroughs, as well as exclusive interviews with his closest friends and colleagues including John Waters, Genesis P-Orridge, Laurie Anderson, Peter Weller, David Cronenberg, Iggy Pop, Gus Van Sant, Sonic Youth, Anne Waldman, George Condo, Hal Willner, James Grauerholz, Amiri Baraka, Jello Biafra, V. Vale, David Ohle, Wayne Propst, Dr. William Ayers, Diane DiPrima, Donovan and many others, with narration by actor Peter Weller, and soundtrack by Sonic Youth. Watch the extended 5 minute trailer full of these famous faces after the break.